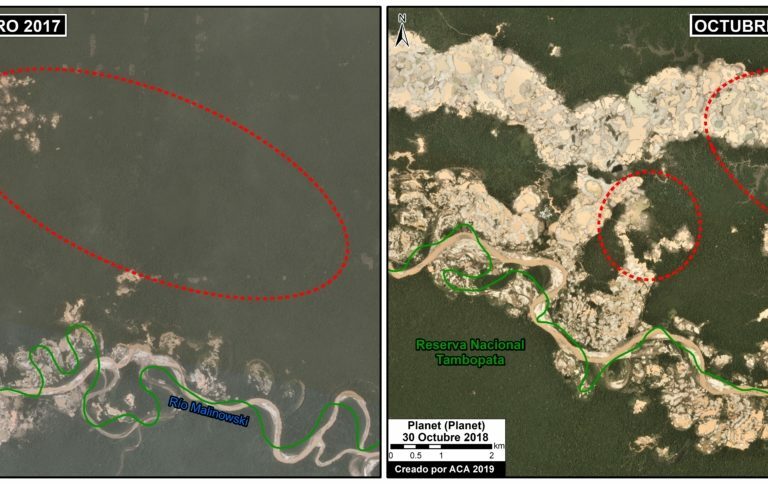 Deforestation in the Peruvian Amazon as a result of illegal gold mining hit record numbers in 2017 and 2018, according to an analysis of satellite imagery by the Monitoring of the Andean Amazon Project (MAAP). 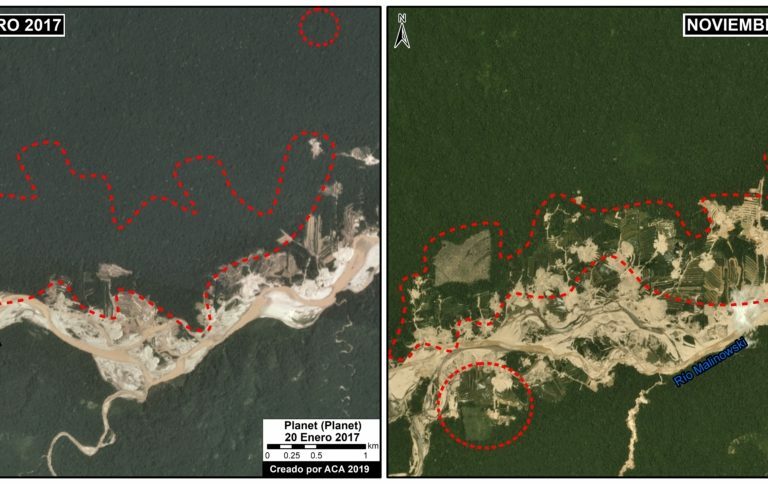 Illegal gold mining has led to historical rates of deforestation in the Peruvian Amazon, a recent analysis of satellite images shows. In the past two years alone, more than 184 square kilometers (70 square miles) of forest have been destroyed in southern Peru, according to the analysis by the Monitoring of the Andean Amazon Project (MAAP). Nearly 93 square kilometers (36 square miles) of forest was devastated by illegal mining in 2018, the highest level since records began in 1985. The figure for 2017 was almost as high, at 92 square kilometers (35 square miles). Matt Finer, MAAP’s principal investigator and co-author of the new report, tells Mongabay that his organization relied for historical reference on a study of illegal mining carried out over the last 32 years by the Center for Amazonian Science and Innovation, known by its acronym in Spanish as CINCIA. The report was developed for the NGOs Conservación Amazónica (ACCA) and Amazon Conservation (ACA). 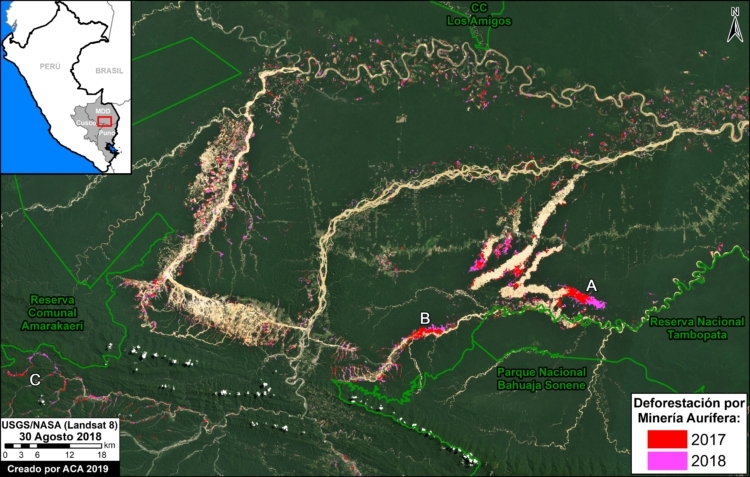 The map shows the progress of deforestation in the southern Peruvian Amazon. Image by MAAP/ACCA/ACA. More than 17 square kilometers (6.5 square miles) of forest were destroyed by illegal gold mining in La Pampa between January 2017 and November 2018. Image by MAAP/ACCA/ACA. The hardest-hit region is Madre de Dios. 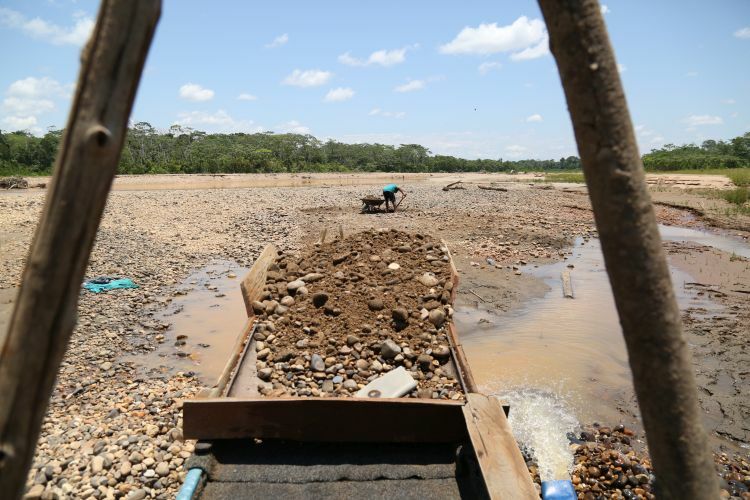 In the area known as La Pampa, located in the buffer zone of Tambopata National Reserve, the loss of forest due to illegal gold mining amounted to nearly 17 square kilometers (6.5 square miles) between January 2017 and October 2018, according to the MAAP report. The deforestation in La Pampa is encroaching into forest concessions and inside the buffer zone of Tambopata National Reserve. Image by the Peruvian Society of Environmental Law. Guzmán attributes a range of crimes to illegal mining: the extraction itself, the financing, and the trafficking of supplies. “We have dedicated our efforts on the people who extract the gold when we should be focusing on people who finance the activity,” he says. Mariano Castro, the Ministry of Environment’s former deputy minister for environmental management, says he’s well aware of the problem. “These figures are painful. I hope the government finally takes care of what is happening in the Amazon,” he tells Mongabay. In Alto Malinowski, illegal mining is creeping toward Bahuaja-Sonene National Park. Image by Vanessa Romo. He cites the case of Carlos Bustamante, the region’s former director of energy and mines, in June 2018. Bustamante and six other officials were accused of receiving payments from miners to approve their ongoing process of formalization. “Here you can see how the regional authorities have been accomplices,” Castro says. In January this year, the detention of the former officials was ordered in Madre de Dios . In the hearings, it was revealed that money transfers had been identified from the mining areas of Huepetuhe, Mazuko and La Pampa, Ojo Público reported. The MAAP report also found that deforestation due to illegal gold mining in Madre de Dios was encroaching into forest concessions and the buffer zone of Tambopata National Reserve. 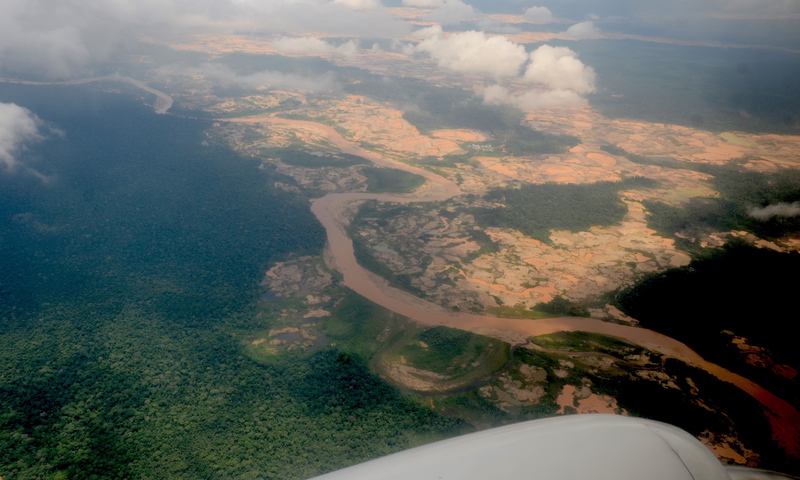 From the air, the devastating effects of illegal gold mining are apparent on both sides of the Malinowski River in Tambopata National Reserve. Image by Yvette Sierra Praeli. 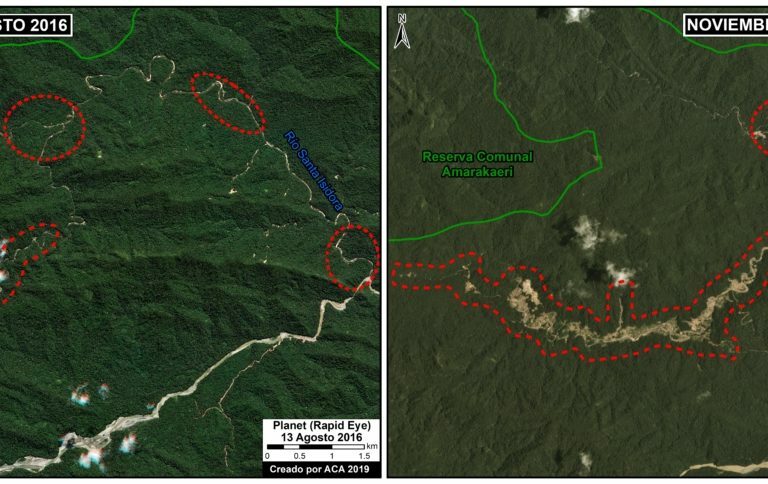 Mongabay Latam reported on the advance of illegal mining towards the reserve last November. 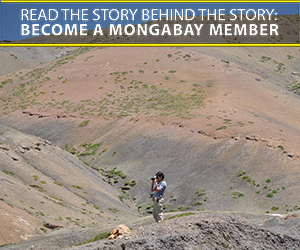 The images were captured during a flyover by the Peruvian Air Force, in which Mongabay participated. Alto Malinowski, also in Madre de Dios, is another sector under threat from deforestation. MAAP’s analysis shows forest loss of 7.6 square kilometers (2.9 square miles) between January 2017 and November 2018. The deforestation here is creeping toward the land of the Kotsimba native community and the buffer zone of Bahuaja-Sonene National Park, which extends over more than 10,000 square kilometers (3,900 square miles) between Madre de Dios and Puno. The map shows the spread of illegal mining in the Alto Malinowski area in Madre de Dios. Image by MAAP/ACCA/ACA. 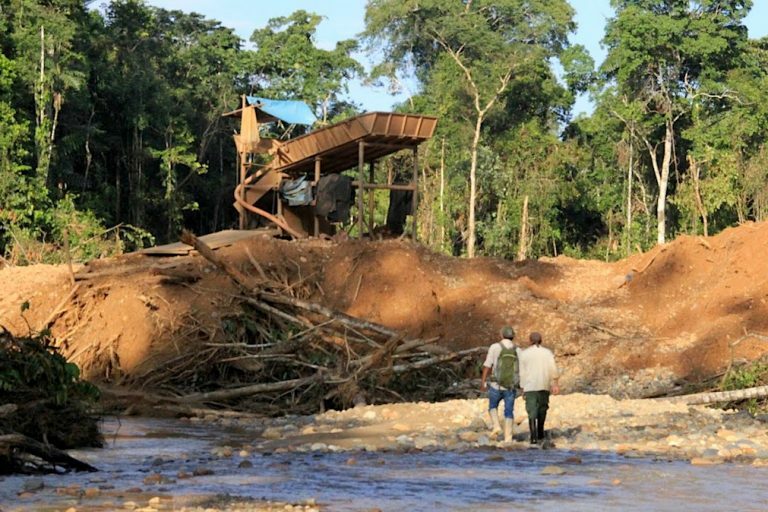 In May 2018, Mongabay reported that the native Harakbut Kotsimba community had been invaded by illegal mining, which spread along the Malinowski River into the sector that borders Bahuaja-Sonene National Park. “Destruction is what one observes during the journey between the community and Bahuaja-Sonene,” Mongabay reported at the time. Another third sector evaluated in the MAAP report covers the forests of Camanti district, in the Cusco region, where illegal mining began after the Interoceanic Highway was built. In this part of the Cusco forest, the mining is destroying the buffer zone of Amarakaeri Communal Reserve (RCA), a protected area. In Camanti, Cusco, illegal gold mining is advancing toward Amarakaeri Communal Reserve. Image by MAAP/ACCA/ACA. The MAAP report confirms what Mongabay reported in April of last year, and puts the figure for deforestation in Camanti at 3.4 square kilometers (1.3 square miles) between August 2016 and November 2018. Guzmán says the problem in Camanti is linked to drug trafficking: “It’s a highly complex issue and you have to enter the area with a large police force,” he says. It’s a similar situation on the Kotsimba land, where police operations involve at least 800 officers. The findings from the MAAP report clearly reveal how deforestation has spread throughout this part of the Peruvian Amazon. Fabiola Muñoz, the environment minister, recently announced the involvement of eight government agencies and departments as part of a strategy to fight deforestation in Madre de Dios due to illegal gold mining. It’s now is up to them to end the problem.